Last chance recipe for February!! Its been a slow month on my blog! One thing thats pretty cool about food blogging is that I can just search my own blog for a recipe! However, I found out that I never did blog about this Cheeseburger Soup that I've made a few times! Which is good, because I am always needing new recipes to put on my blog. I have been really trying to avoid white carbs: bread, rice, pasta, etc. Its been extremely difficult. I of course have been craving cheeseburgers and sandwiches like crazy! Luckily, I remembered this soup just in time for it still to be winter and chilly enough to enjoy a nice, hearty soup as opposed to caving in to bread. Not that this soup is healthy, because its super high in fat and calories! ;) I know it might sound like the weirdest soup ever, but it is so, so good! And it couldn't be easier, or more economical, to make. Brown the ground beef in a soup pot over med-hi heat until pink is gone. Drain. Set aside for a minute while it keeps draining. Add the chicken stock to the pot, stir to pick up any meat particles stuck on the bottom of the pan. Add the half and half. Bring to a simmer. Cut the Velveeta into chunks, add to soup pot, along with the cheddar cheese. Add the cooked ground beef back in the pot, as well as the Rotel, Italian seasonings, salt & fresh ground pepper. Keep on a low simmer until all the cheese is melted, anywhere from 5 to 20 minutes. If it doesn't seem thick enough, you can add about a teaspoon of flour to about a quarter cup of milk and whisk together into a "slurry", then add to the soup. Simmer until its thick enough to resemble a cheese sauce. Garnish with the lettuce, onions, & Sriracha. Enjoy! Serves about 6. *I always try to use organic meat, veg, dairy, etc, and I use organic, low sodium broth. This should always go without saying when it comes to my recipes. BTW, Paradise Foods (Novato & Corte Madera) has the absolute best variety of organic meat!! I buy 99% of my meat at the Novato location. I do my shopping primarily there and at Marinwood Market, but I do like to shop at Trader Joes once in awhile. They have a great, inexpensive wine selection, but I don't buy my meat there. Cheap spices & olive oil, too! But great quality!! Tri Tip Sandwiches! I marinated the Tri Tip in Worshestershire sauce, garlic, onions, and rosemary overnight, then grilled it on the BBQ (ok, my husband did that part!). Sliced thin, served on a Ciabatta roll with carmelized onions, white cheddar and horseradish aioli. Super delicious! Used the leftovers in burritos for lunch. So, I've been wanting to challenge myself on my blogging lately. I currently have two challenges. The first one is a 28 day challenge that is to improve my blog just a little bit each day in February. Little things such as rearranging buttons, getting new fonts, etc. I haven't exactly started yet. I'm not sure how it works as far as accountability is concerned, but its just a matter of me taking the time to read more about it. My second challenge is that back in the fall, I offered to help a friend of a friend who is writing a cook book. (Am I jealous much? You bet!) Well, he didn't need my assistance back then, but he's asking for it now. I don't get paid or anything like that, but it will help me to push my culinary limits and use ingredients that I normally wouldn't use or explore cultures that I normally wouldn't even think to try. Well, I got my list of 6 recipes that I need to test and I'm already intimidated. Not necessarily by the ingredients or cultures, although its true that I'm not looking forward to working with Conch or Salmon, but I'm scared of the techie stuff thats included. I'm no food stylist. I don't have lots of props. I'm not even sure how to open a zip file! lol I'm trying not to get overwhelmed by the scary stuff. As long as I can create the recipes, I'll go from there. I think I see a few dinner parties in my future, as I only have about 4 weeks to complete this task and theres no way my husband and I can eat all of this food. 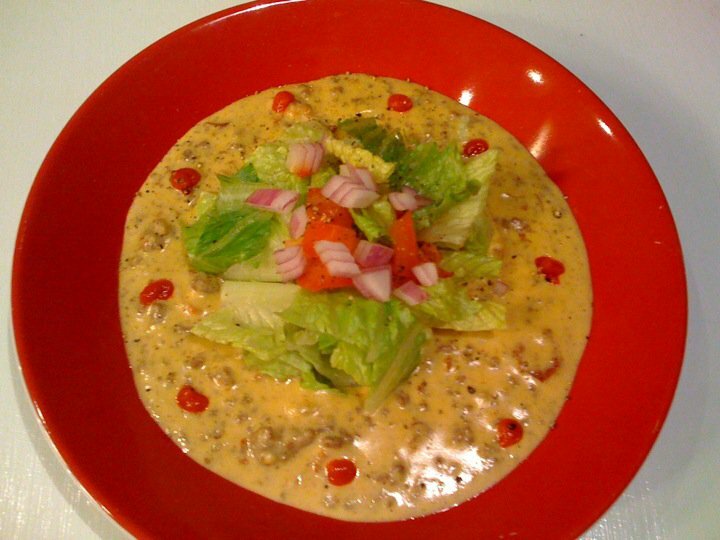 Anyway, this post is supposed to be about the Crab Louie. Its Dungeness Crab season here in the Bay Area. We had a shortage of it over Thanksgiving and Christmas and I've only just now had a chance to buy some at our local grocery, Marinwood Market. I thought it would be healthy and hearty. And aside from picking the crab meat out, its really easy. 1000 Island dressing (I used store bought. This was a huge mistake. Next time I will make it homemade. Wash and prepare all veggies. Toss the lettuce and put in one big bowl, or individual bowls. Put a handful of each veggie ingredient along the rim of the bowl(s). Place a generous portion of the crab in the middle, drizzle with the dressing, and enjoy! I forgot this, but a lemon wedge garnish would be lovely! *You can get crab meat already picked from the shell from your fishmonger. Mine didn't have any, so he cracked and cleaned a whole crab for me, which made it easier. But next time I'd rather use the pre-picked meat.